You know you've got the fishing bug when you'd rather use your 1/2 hour lunch break to squeeze in some therapeutic fishing rather than fill your stomach. 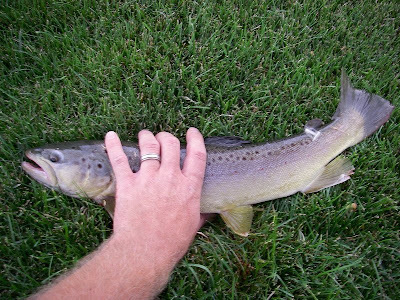 Within minutes of the workplace, I've got several places in any direction to flick a lure or dunk a worm. 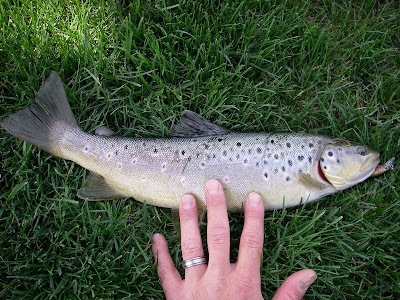 Whether it's Utah Lake or a nearby farm creek, the option is in a constant tug of war with the prospect of food. The priority seems to shift quite frequently. This little corner of the universe is full of surprises and I've been the benefactor of many. Rarely do I fish this area longer than 15 or 20 minutes and rarely do I leave with a sneer. A host of fish swim these waters and it doesn't really matter which species is biting to me. I'm just there to kill time anyway, right? Obviously, some fish are more rewarding than others in the end, but when the goal is to just escape the toil of earning a day's wage, it's all good. 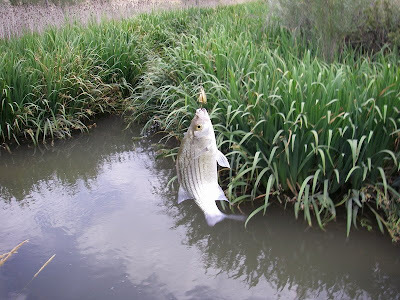 The majority of the fish I've hooked on break or on my way home from work are white bass. 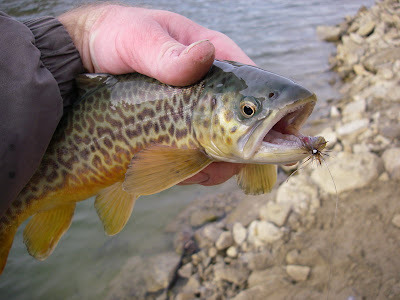 These simple little aggressors are everywhere and will hit anything you put in front of them. What they lack in brains, they make up for in zeal. Without fear, they'd attempt to wolf down a padlock, given a good presentation. In the dog days of summer, I can always rely on a few whites to come and play. 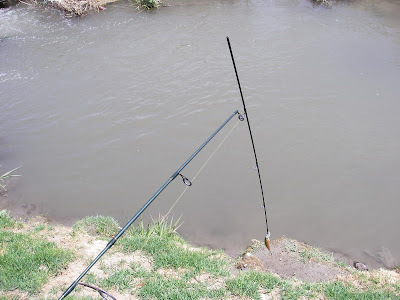 There are also plenty of carp in these waters and they're strong fighters but thankfully, they usually ignore what I'm throwing at the other fish. 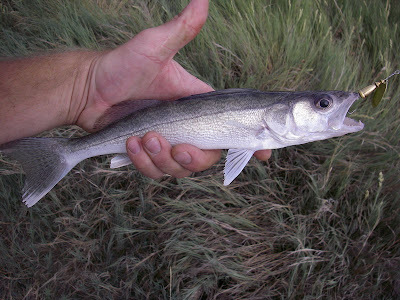 My first walleye came from one of these spots after work, one night. Nothing spectacular, but it was a first and those are always welcome. 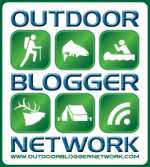 Occasionally, I stumble upon other 'eyes or the odd bluegill while harassing the whites. 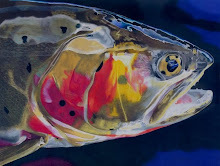 There are even koi that have found their way into the streams. 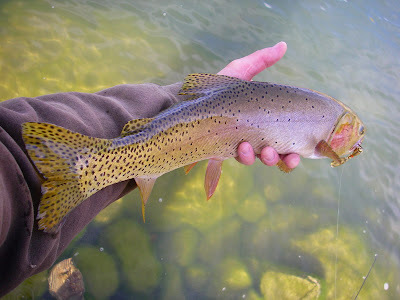 What really get me pumped are the big beefy browns that live here. Sometimes, it seems like they've all moved away, but other times they won't leave you alone. 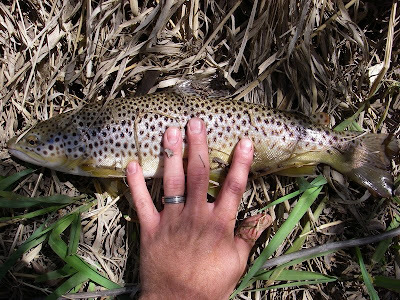 Slamming lures, ripping out drag and taking off into the undercut root systems of the thickly weeded banks, these browns are wild and very healthy. 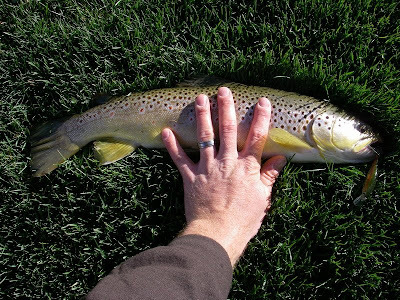 Long growing seasons and plentiful forage keep these browns athletic. 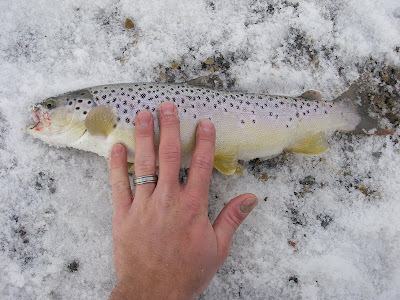 Catching browns from 14-19 inches is commonplace for this system of creeks, if you know where to look. Sometimes, it's as simple as pulling over for 30 seconds. Looks like someone else's loss was my gain. 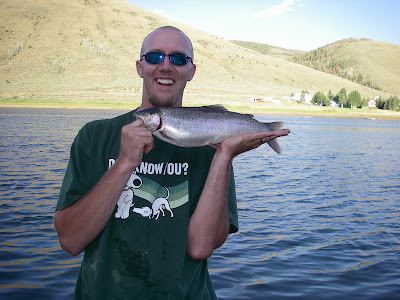 I won't lie, that free lure caught quite a few whites before it parted ways with me. The fish was released and is hopefully still awaiting my return. That's the way a lunch break should be! 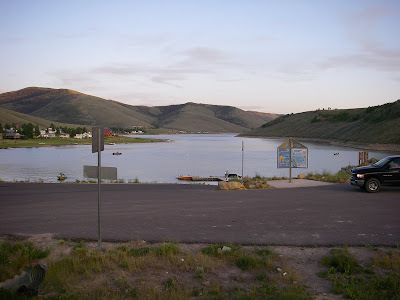 One of the state's most popular fishing holes is Scofield Reservoir. 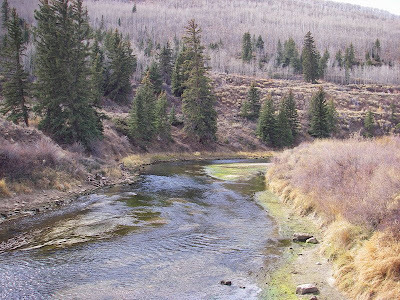 Fertile waters keep the food chain in line for an impressive population of trout in this large impoundment. 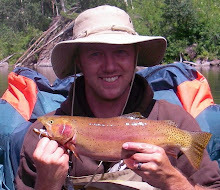 Rainbows, cutthroats, tigers, and browns grow quickly here and will take a wide variety of offerings. 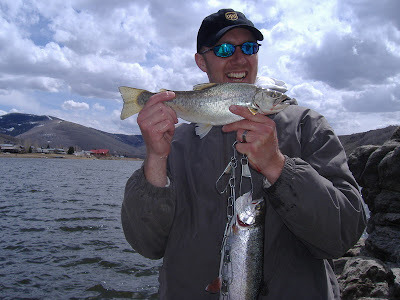 A great place for any fisherman, Scofield produces large numbers of nice fish. It's not uncommon to hear of 20+ inches from multiple parties, when the bite is on. All types of methods seem to work well on any given day here. I've had 40+ fish days where it really didn't matter what I used, although there have been some trips that ended with a skunk. 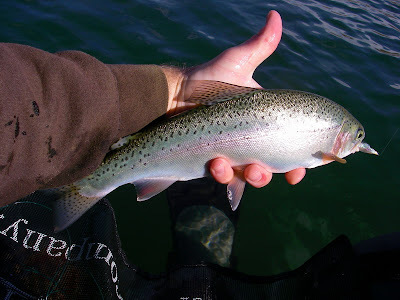 Most of my fishing has come from the shoreline here, but I've got a couple of places that usually treat me right. 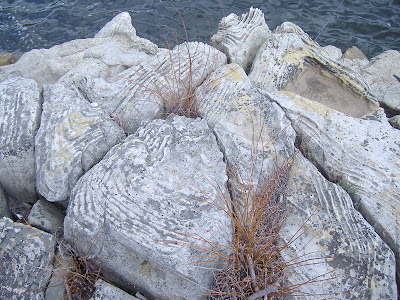 The first spot is the rocky area, just north of the NW boat ramp (Madsen Bay Unit). The sudden drop-off really creates a lot of structure for bait fish to hide in and the sporting species are never far away. 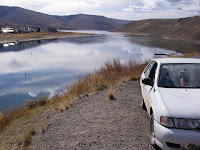 It's a great place when the water is at higher levels. 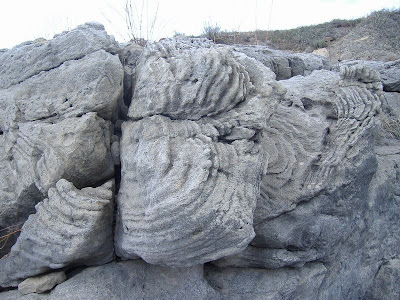 The rocks, themselves are pretty neat to view, as well. My other productive shore spot is right across a tiny bay from the north end of the dam. 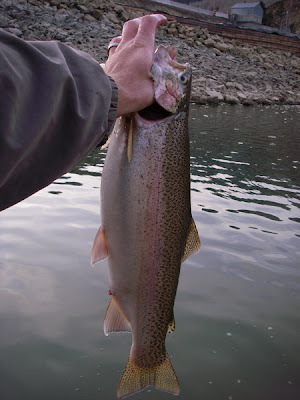 Again, plenty of structure (the dam) and a good drop-off make for good fishing, usually. 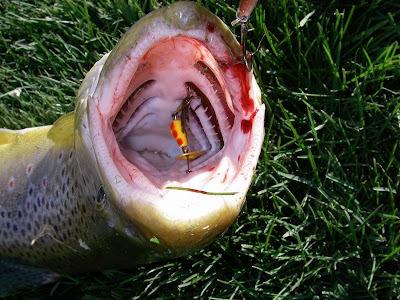 Scofield from a tube can be a blast with a fly rod with a white zonker on sinking line. 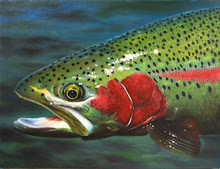 Plenty of other flies can do the trick, but the zonkers and other streamers will attract some hogs. The usual spin gear is good too. 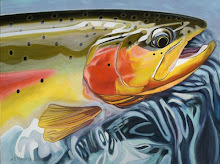 Lucky Craft lures, Kastmasters, Blue Fox spinners, and even the old worm under a bubble can keep you busy on a good day. Being mobile really boosts the catch rates as opposed to waiting for a school to pass. The winds can get vicious at times, but it's usually a nice lake for a float. 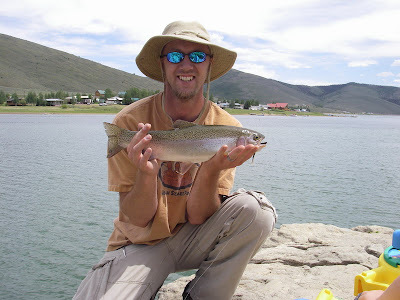 The rainbows at Scofield are the most prevalent fish in the lake and can range in size from 1 ounce to over 7 lbs! 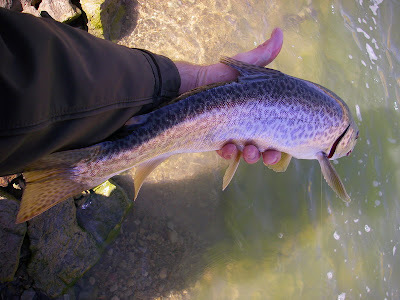 Using a minnow (redside shiners and chubs are two of the lake's forage species) helps to separate the larger, predator sized fish from the runts that also swim these waters. 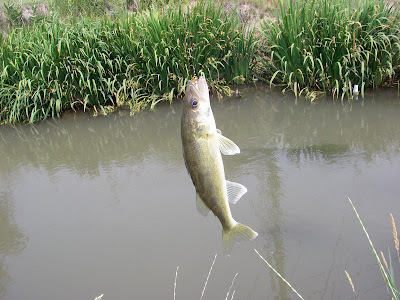 There is a history of chub problems here and that can throw the balance off when that population gets too large. 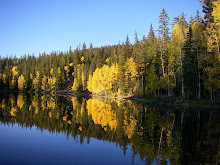 The DWR enacted a slot limit restriction in 2009 and heavily stocked predatory tigers and cutthroats in hopes of battling the local nuisances. 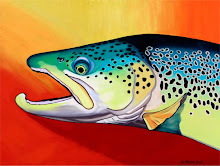 All tiger trout and cutthroat trout between 15-22 inches must be immediately released, with a two fish limit (only the listed fish) under 15 and only one fish over 22 may be kept. 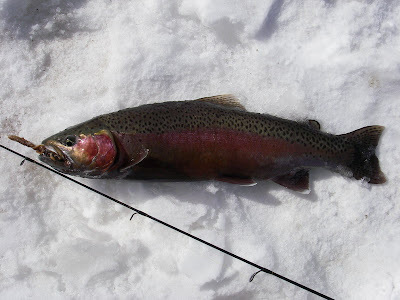 Rainbows are fair game, as they do not fall into the slot situation. 4 rainbows may be taken, any size. 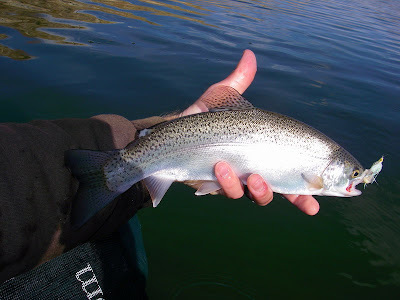 In the past, the fish have been known to reach impressive sizes rather quickly and that's what the DWR is trying to preserve in their efforts to control the chubs, which grow even faster and reach sizes larger than the typical bait fish. 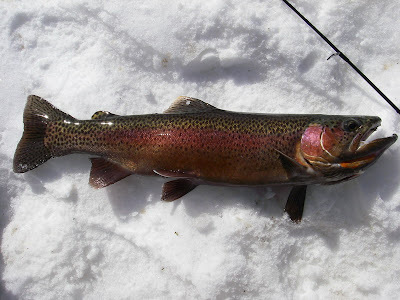 While reaching these sizes, they will feed on similar foods as the sportfish and that slows growth rates, in the long run. 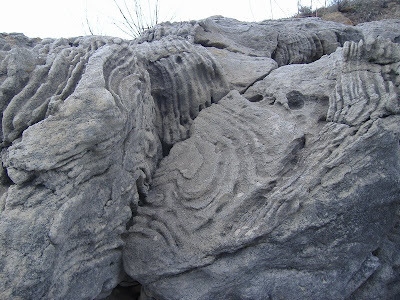 2008 was a particularly long winter and the ice lasted well into the spring time. 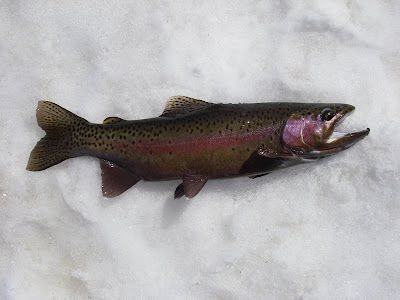 When a small window of open water finally showed itself along the dam arm, I lucked into catching some gorgeous spawn colored males that were staged just under the ice shelf. A visible, glistening trail of milt flowed with the current toward the outlet grate near the dam. The fish ranged from 15-18 inches and very weary of what they'd bite. 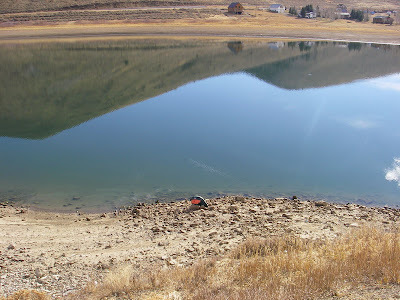 There's a wild population of cutthroats in the lake, but it is being added to by the DWR, due to the chub control efforts. 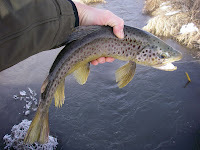 Wild cutts can still be found in the inlets, when they're open to fishing. 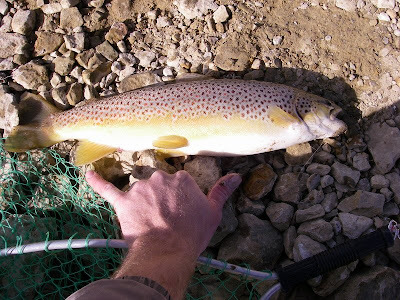 Tiger trout # 2 followed shortly behind the first and many more have filled my hands, since. 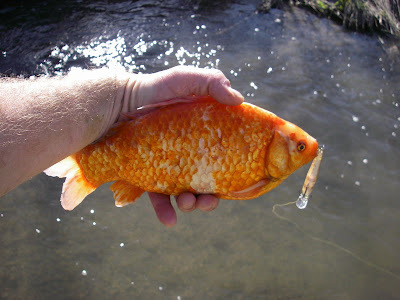 These mutant freak fish are well known amongst fisherman as a novelty catch. 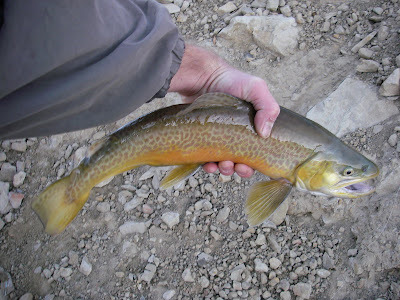 A hybrid cross between a brook trout (char) and a brown trout, tigers have great genetics to provide a strong fight and tasty flesh. 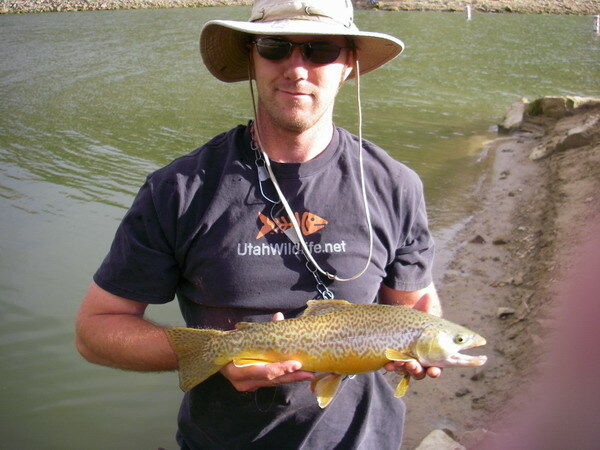 The DWR has done really well with their tiger trout program and Utah is standing out as a leader in regard to tiger trout production. 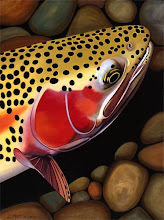 Many purist fishermen will thumb their nose at this designer species (some won't even call them a species), since they wouldn't exist without human interference (moving native species to different continents...). No matter what is thought of them, however, they are here to stay and may as well be enjoyed by their captors. Personally, I'm a fan. 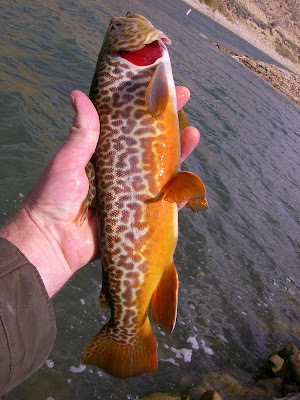 Tigers don't have to spawn which makes them easy to manage, they are more resistant to common trout problems that rainbows are more sensitive to, plus they exhibit faster growth rates than a fertile species. 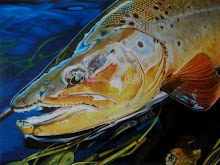 The fight is what tiger trout gain the most respect with and I won't object. A rainbow may jump, thrash, and roll on the surface whereas a tiger will make powerful runs to the bottom or a strong sprint in the opposite direction, taking drag at will either way. They tend to save their surface show for last. Twisting, rolling, and head shaking, many tigers I almost met have fought their way to freedom. Autumn is the best time to catch the most eye pleasing specimens, as tiger males will turn a deep bronze color for their false spawn. Browns in Scofield are rare, but they do exist. I've caught a couple of them, but many hours of fishing passed before either. My first one was a nice hen of about 17 inches, full of eggs. She was caught on the last day that Scofield had open water that year...Took a minnow and sat on it. I didn't know she was there until I started reeling in to leave for the day. On the other side of Scofield's dam flows Lower Fish Creek, one of two main streams that combine to form the Price River (the other stream being the White River). 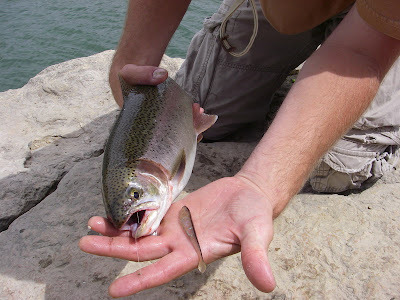 Variable outflow from the dam, provides an ever changing set of conditions for anglers to overcome. 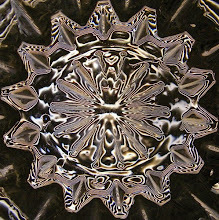 The water can be little more than a trickle at times or it can be over 4 feet deep where the above photo was taken. Times of low water force the prolific browns to concentrate into isolated pockets of deep water. Only the fittest survive these periods, but the fishery benefits from the occasional crowd-thinning drought. 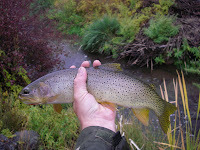 I've only caught small browns, but I haven't been too far downstream, where the average size is much nicer. 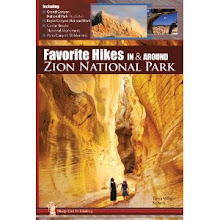 More chapters have yet to be written about my personal endeavors at Lower Fish Creek, I'm sure. I'll update as these trips happen.